Big J Manager Dave Johnson, and employees Amanda Gnehm and Jonathan Stockdale load plastic Easter Eggs with candy for communities from Richmond to Grace Idaho. Big J's has been supply eggs for community celebrations for over 30 years. Easter Egg festivities abound in Cache Valley on Saturday, April 20. Starting at the south end of the valley is the Easter Egg Hunt in Paradise sponsored by the local Lions Club. It will be held at the town square. 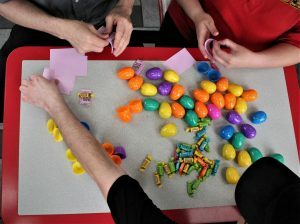 Big J’s, located at 190 S. 200 W. in Richmond, stuffs 25,000 Easter Eggs between their two restaurants and distributes them to communities from Richmond up to Grace, ID for Easter. Before the dash for the eggs, the town traditionally has a bake sale at 9:30 a.m. Participating residents must present two pies. The Paradise Fire Department tastes and judges the pies. They will sample just one of the pies. Hyrum City will hold their Easter Egg Hunt at the City Square at 83 W. Main, starting at 9 a.m.
Nibley City has moved away from the traditional Easter Egg Hunt. The city will be holding an Easter Egg Run Hopstacle Course on April 20 at 9 a.m., located at Virgil Gibbons Heritage Park at 2456 S. 800 West. Registration can be done the night before or at 8 a.m. the morning prior to the event. For more information, contact Nibley City at (435) 752-0431. Millville City asked the Easter Bunny to hide eggs at Millville Splash Pad Park, located at about 450 East 300 South. Participants should bring their own baskets and cameras. The dash for candy will be on Saturday, April 20 at the Millville Park at 10:00 a.m. sharp. By 10:05 it’s over. Providence City is not doing an Easter Egg Hunt, however the Youth Council and Miss Providence Royalty have invited the Easter Bunny to visit the Providence City Office Building Saturday, April 13, from 10:00 a.m. to 11:30 a.m. There will be craft activities, treats, and prizes. Logan City is not holding an Easter Egg Hunt, but the Logan Downtown alliance is holding an Easter Walk. For those who may not want to do a traditional run and grab hunt, downtown business will open their doors for children wanting a treat. The Easter candy collection from downtown businesses will be from 10 a.m. to 4 p.m.
North Logan City will hold their Easter Egg Hunt at Elkridge park at 11 a.m. They will divide children into different age groups and will hold a separate Easter Egg Hunt for people with disabilities beginning at 10 a.m. For more information call North Logan City at (435) 752-1310. Hyde Park Easter Egg Hunt, sponsored by the Lions Club, will be April 20 at 9 a.m. at the park at 65 East Center Street by the Church of Jesus Christ of Latter-day Saints chapel. The hunt is limited to 1 to 8 year old children. 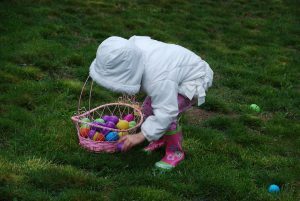 Greater Smithfield Area Chamber of Commerce will hold an Easter Egg hunt at Mack Park, 70 Canyon Road, and will begin April 20 at 9 a.m.
Richmond City’s Easter Egg Hunt will also be April 20 at 9 a.m the in the city park located on Highway 91 (200 West) between Main Street and 100 South. If you know of any other Easter Egg Hunts we haven’t mentioned, leave a comment below. I think you have the wrong time for the Smithfield egg hunt. Join us at Cache Humane Society at 10am for our East Egg Hunt in the Valley View Dog Park. See our Facebook page for start times for each age range.